Following the official observance of the 2016 International Day of Peace at the United Nations on September 16th, a dedicated group gathered across the street to send their prayers for peace to every nation of the world. 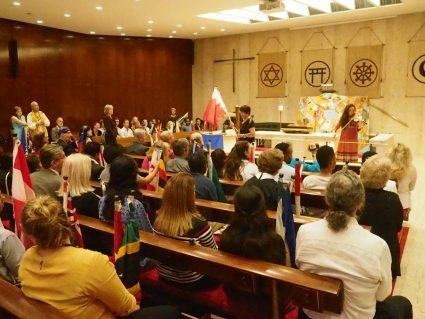 More than 100 people filled the Tillman Chapel at the Church Center for the United Nations for an event hosted by Chaplain Dionne Boissiere of the United Methodist Women and organized by the World Peace Prayer Society and the United Religions Initiative. Included among the participants was a busload of youth brought to the International Day of Peace observances from Vermont by Children of the Earth. These young people, many of whom are refugees from various countries, came to the event directly from a luncheon visit to the Mission of the United States, where they were greeted by Amb. Samantha Power. Rev. Boissiere opened the event with a warm welcome that reiterated her commitment to opening the chapel to the International Day of Peace each year. 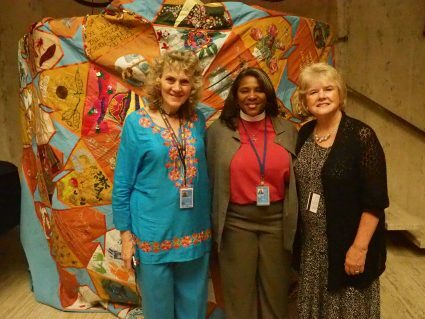 Deborah Moldow, Representative to the United Nations for the World Peace Prayer Society, serving as M.C., began by introducing Monica Willard, Representative to the United Nations for the United Religions Initiative. Monica read the URI’s moving Nuclear Prayer in the spirit of the International Day of Peace. She also spoke about some of the inspiring events planned to take place for the International Day of Peace on September 21st all over the world. 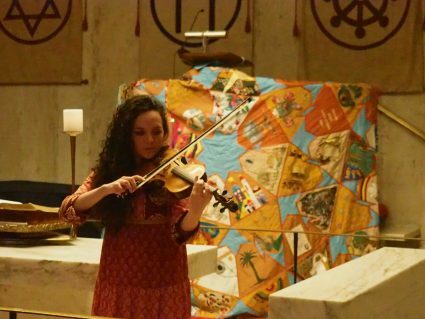 Interfaith filmmaker Ruth Broyde Sharone next told the touching story of the Israeli Palestinian Women’s Peace and Healing Quilt, which was displayed behind the chapel altar. A brief video explained this joyful vehicle for healing and peace in the Holy Land. Deborah then explained the World Peace Flag Ceremony, in which all present would participate, raising the flag of every Member State of the United Nations – the very same flags that had been lifted by students at the Peace Bell as UN Secretary-General Ban Ki-moon rang it that morning for the final time in his administration. She demonstrated how each participant would announce the country name and present the flag. Deborah then introduced Rev. Patrick McCollum to tell the story of the World Peace Violin, hand crafted to contain fragments from around the world from places of conflict that had been healed. Patrick introduced Ms. Sasha Reed, a beautiful young violinist who would accompany the ceremony with her transcendent music. The flag distribution team of Brandon Perdomo, the WPPS Youth Representative to the UN, Yuji Hiraiwa, Akiko Imaizumi, and Dr. Joni Carley took their places, and the World Peace Flag Ceremony began. 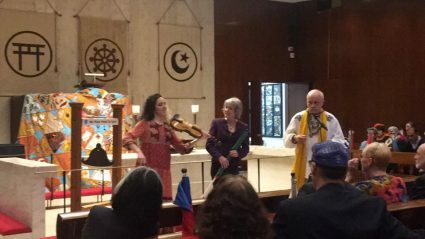 As the music of peace flowed from the World Peace Violin, people of all ages and many nationalities took turns praying for peace to prevail in each country as its flag was raised. From time to time, Deborah sounded the World Peace Bell made from recycled weapons of war and everyone paused to proclaim, “May Peace Prevail on Earth!” The World Peace Flag Ceremony was a profound experience, as the chapel filled with everyone’s prayers from the heart. One of the many powerful parts of the day was the flag ceremony. 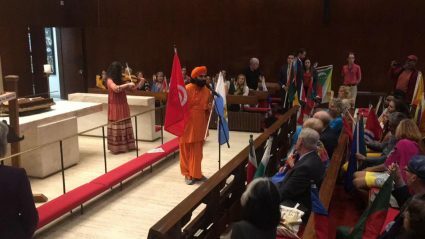 Taking part in the UN chapel, 196 flags of the world were held up and met with the wish “may peace prevail,” while the world peace violin was played. There is a great deal of conflict in the world that seems to be caused by conflicting ideologies. To be in a chapel in which one’s faith didn’t matter and the hope for peace was sent out to everyone was truly incredible.